We strongly urge you take the time to review and understand the Fire Danger Ratings so you can react appropriately to any FDR forecast. 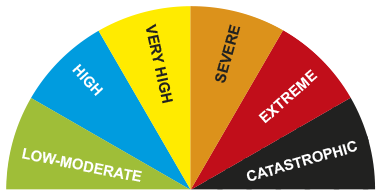 The Fire Danger Rating (FDR) warns of the potential impact of a bushfire on any given day, based on forecast weather conditions. This summer the Fire Danger Rating will be widely publicised. Categories Severe, Extreme and Catastrophic indicate a fire will be unpredictable, uncontrollable and fast-moving. If a fire breaks out in these conditions, the safest option is to relocate to a safe place away from any fires. Ratings above 50 occur in Tasmania around three times a year. Ratings above 75 have occurred only half a dozen times in Tasmania during the last 90 years. However, with the impact of climate change, the potential for such days is increasing. It is worth noting that the Fire Danger Rating on Black Saturday in Victoria on 7 February 2009 approached 200. Tasmania Fire Service will provide as much information about bushfires as possible, principally through its website www.fire.tas.gov.au and ABC Local Radio. It will use three levels of messaging to help people make the right safety choices. However, remember that fires can threaten suddenly and without warning, so you should always be ready to act even if you don't receive an official emergency warning. 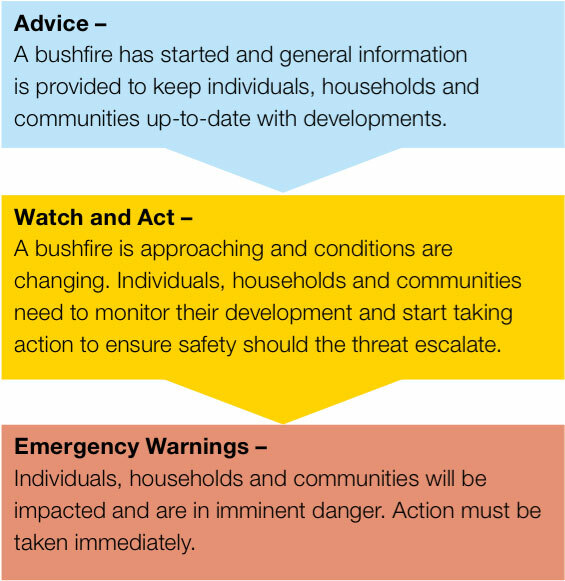 Tasmania Fire Service messages take into account the risk posed by fire, which will depend to some extent on the Fire Danger Rating and how quickly bushfires are spreading. The three levels of alerts have taken into account concerns about over-warning people. These concerns, coupled with a tendency for people to act at the last minute, have determined the choice of message levels. While the intent is to inform people before fires directly threaten them, fires can break out suddenly and without warning, making it impossible to get messages out in time on all occasions. You should be aware of the forecast Fire Danger Rating each day during summer, and remain alert to the potential for bushfires to break out suddenly and spread rapidly. 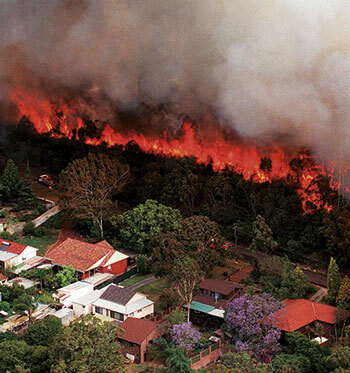 You should not wait for an official emergency warning if you are threatened by a bushfire. Emergency Alert is a national telephone-based emergency warning system to warn the public in the event of major emergencies, including serious bushfires. Using Emergency Alert, emergency warning messages may be sent by emergency services as recorded voice messages to fixed phones and as SMS text messages to mobile phones to people in affected areas. If you receive an emergency warning about a bushfire or other emergency occuring near you on your fixed or mobile phone, act on the warning - it could save your life. Fires can break out suddenly andwithout warning. There may be no time for official warnings. You will need to use your own judgement. Tas ALERT is the Tasmanian Governments website that brings together information from emergency services and government agencies.